Watercolor Works: New Lesson for This Weekend! 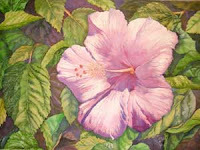 This piece, Pink Hibiscus, will be the next lesson here on my blog. If you would like to paint along, please visit my etsy shop (http://watercolorgirl.etsy.com). Click on the icon for the Online Class. For $5.00 I will send you a pdf of the drawing and photo reference. Then, you can visit back on a daily basis, or whatever is convenient for you, to paint along! This piece was painted on a full sheet of watercolor paper, 23 x 30 inches, but you can also paint it smaller, if you like. The reference will be sent in a small format, which you may enlarge to full size.